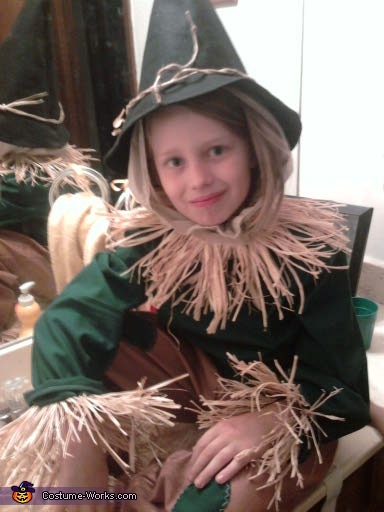 This is my older son as the Scarecrow from the timeless classic The Wizard of Oz. Our entire family dressed as Oz characters, even my rottweiler dressed as Toto! I made everyone's costumes myself, from Simplicity patterns, which are no longer in print. I honestly think his scarecrow is the most awesome costume of the bunch! I think this costume is awesome for a child. No face mask to deal with and very easy for trick or treating. Not to mention the memories it gives.Great costume and great job. Awesome costume! Very safe without a mask. I like the creativity and love that went into making the costumes. I also like the old patterns. That's the way our moms did it.